The Lifetime ISA is a savings vehicle available in the UK designed for first time house buyers and those preparing for retirement. In this article I will provide a comprehensive guide to the Lifetime ISA and be realistic about the real returns when you include the government bonus and any interest paid. I currently hold a Lifetime ISA through the Skipton Building Society. - What Is a LISA? Cash or Stocks and Shares LISA? How Long Do You Want to Hold The Lifetime ISA For? Is The LISA Worth it? The Lifetime ISA (LISA) is a tax-free wrapper which can be used to either save for your first home or later in life (age 60). When Was The Lifetime ISA Introduced? In March 2016, the then chancellor of the exchequer George Osbourne announced the introduction of the Lifetime ISA. The Lifetime ISA was launched as a savings product in April 2017, although there were limited providers who offered the product at launch. How Much Can You Contribute To A Lifetime ISA? The rules of the Lifetime ISA dictate that you can contribute up to £4,000 each tax year and the government will add a 25% bonus on top of this contribution. So if you contribute the maximum £4,000 this tax year, before the tax year deadline, £1,000 will be added on top, by the state. The contribution also counts towards your annual ISA limit. This is £20,000 for the 2018/2019 tax year. Your savings can be held as cash, investments or both. Since this is an ISA, any asset growth or income is tax free. What Are The Age Restrictions to the Lifetime ISA? You must be aged 18-40 to open a LISA account but you can contribute until you are 50 years old. You can only withdraw cash/investments from your LISA penalty-free if you: use it to buy your first home; withdraw it after you turn 60 years old; or if you are terminally ill with less than 12 months to live. If you are putting it towards your first home, the property must cost £450,000 or less (nationwide). You must also buy with a mortgage and the property must be bought at least one year after the LISA was opened. You must also use a conveyancer/solicitor to act for you in the purchase. There is a 25% withdrawal charge if you want to withdraw cash/investments from a LISA if the circumstances above don’t apply to you. This effectively wipes out the gain and then some. The answer will really depend on how long you want to hold your LISA for. The main decision maker will probably be, are you saving for your first home or are you saving for later in life? If you are saving for life after 60, outside a pension, a stocks and shares LISA is probably the best option. The reason for this is that over the long term, the market tends to do better than cash. The longer the time period, the more likely this will be true. In the short term, especially if you’re planning on buying a first home at some point in the next 5 years, the cash LISA is probably the best option. Markets are difficult to predict over the short term, so cash will be a safer investment. What Is The Catch With A Lifetime ISA? Here’s where it gets more complicated. The catch with a LISA is that you only get the bonus on your annual contributions, not your annual balance. So if you contribute the maximum £4,000 in this tax year, you will get a £1,000 bonus on top. If you do not contribute anything more in the next tax year, you will not get any bonus on top. You can still get interest (cash) or growth (investments) but you would not get any government bonus. How Long Do You Want To Hold It For? Here is why it’s important to take into account how long you are holding your LISA for. Let’s imagine you are 20 years old and looking to save for your first home. You have the ability to contribute the maximum £4,000 to your LISA each tax year. As a result, each tax year you will get £1,000 added on top of your contribution. The bonus is now paid monthly, so you could effectively contribute the maximum at the start of the tax year and benefit from almost a full year of interest/growth on the £1,000 bonus as well. Currently (as of June 2018) you can only open a cash LISA with the Skipton Building Society. You have a bit more range if you are looking to open a stocks and shares LISA but if you’re looking to save in the relatively short term, you might decide a cash LISA is the way to go. The current interest rate on the Skipton cash LISA is just 0.75% (AER), increased from 0.5% last year. Now you might say, it’s the 25% government bonus that I’m getting the LISA for. A 25% bonus seems generous and at the end of year one, your balance will have increased to an amount just over £5,035. You have only contributed £4000 so that’s an annual growth rate of nearly 26%. Most investors would be delighted to see a growth rate that high. So next year you do the same. You contribute an extra £4,000, get the £1,000 bonus on top and your account balance before interest is now over £10,030. If the interest rate stays the same at 0.75%, your account balance at the end of year 2 is now just over £10,110. The bonus plus interest has added around an extra £1,075 to your LISA balance this year. On the face of it, the bonus and interest increase your balance by a substantial amount each year. But it’s easy to forget that the original £4,000 you contributed in year one doesn’t get any bonus on top. The bonus on this original £4,000 was already added in year one and now it just gets the interest on top. Interest of only 0.75%. Put another way, at the end of year 2 you have contributed £8,000 in total. Your balance is sitting at around £10,110. That is the equivalent of putting away £8,000 for 2 years (the same amount of time) with an interest rate of just over 12.4%. This still seems like a large number but it’s not as large as you might think considering you received 2 substantial 25% bonuses and 2 lots of interest on top. Effectively what happens is that the longer you hold your LISA, the more influential the interest rate becomes on your long term growth. Below is a figure which illustrates this phenomenon. It displays what happens to the equivalent annual growth rate of your LISA over a period of 10 years. The green refers to a LISA with a 1% interest rate and the blue refers to a LISA with a 5% interest rate. After 10 years, you would have contributed £40,000 to either LISA. You would have received a total of £10,000 in government bonuses on top of that amount. This occurs because all of your contributions over that period of time no longer receive a bonus the year after they are contributed. You only receive annual interest on the amount previously contributed. 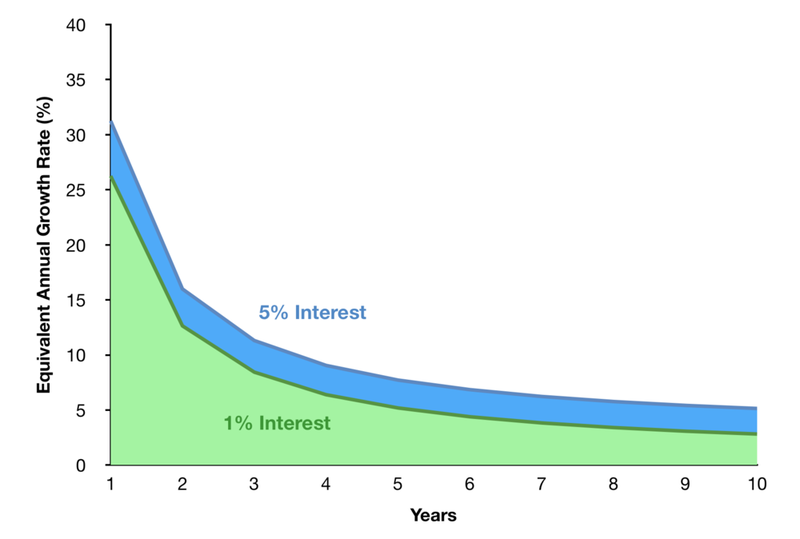 If this interest rate doesn’t change, or if it remains low, this drags the equivalent annual growth rate of your LISA down every year you hold it. I think if you’re saving over the short term for a first home a cash LISA is the way to go. In the example used above, even if the interest rate stays at around 1% over a period of 5 years, including all bonuses, that is still the equivalent of contributing the maximum and growing at 5% per year. And that growth is guaranteed, unlike an investment. However if I already had a first home and I was looking to use this type of account for later in life, I would go with a stocks and shares LISA so I could invest rather than store cash. It’s important to take into account how saving in different ways can affect your behaviour. The LISA incentivises you to save and I would definitely not disregard that advantage. If you know your contributions this year are going to be boosted by 25%, this might encourage you to save more and spend less. So even if you saved the maximum amount for 10 years and the equivalent annual growth rate was only around 2.82%, that balance might be larger because you were incentivised to save in the first place. In this example I am only taking into account the growth of your LISA. If you have other savings, they will likely be growing as well. So whilst the equivalent annual growth rate of your LISA might be lower than you originally thought, you might have other savings which are growing alongside your LISA. Think about your entire portfolio. How has your net worth changed over that period? Answer this question taking into account all your savings and investments. And don’t disregard how inflation can eat into your real returns. Is The Lifetime ISA Worth It? Like any savings vehicle, there are pros and cons to the Lifetime ISA. If you’re planning on buying a first home in the UK at some point in the next 1-8 years I think a cash LISA makes a lot of sense. Seeing a 25% boost to your annual contributions is encouraging and if this helps you get into the saving habit then I think it can be really powerful. It can also guarantee a large effective annual growth rate over the short to medium term. However, before making any financial decision, it is best to be as informed as you can. With time, your asset growth rate becomes more important than the 25% LISA bonus. The less time you plan on holding your cash LISA, the higher the equivalent annual growth rate will be. Do you have a Lifetime ISA or are you thinking of opening one? Let me know in the comments down below and don’t forget to drop a like. The reversion to the interest rate phenomenon is an important one but it’s not getting a lot of attention by major news outlets or financial publications. For that reason, I’d ask that you share this article around, especially with anyone who may benefit from a Lifetime ISA. Direct debits are sometimes required for switching bonuses or top interest rates. This is a complete guide to the direct debit. My portfolio of accounts here in the UK. This includes current accounts, savings accounts, ISAs, LISAs and investment accounts. Regularly updated. Meerkat Meals is the Compare The Market cousin of Meerkat Movies. Here’s a guide on how it works, where to use it and how to get it. Do you keep track of all your financial assets? Here’s why it’s important and why a simple spreadsheet is all you need. Free download available. The Lifetime ISA is a tax-free wrapper for your first home/retirement savings. But there’s always a catch. Here’s my comprehensive guide to the LISA. Meerkat movies gives you access to 2-for-1 movies for one whole year. So where can you use it and how did I get it for £1.17? Maximising your bank account interest is about stemming the effects of inflation. Here’s how to take advantage of all of the different account types.